John Losty, son of Matthew J. Losty & Mary Jane Losty of Kildare County Ireland, was, most likely, born prior to 1825. His mother Mary was 45 years old when she gave birth to John's brother, Patrick, in 1825. John's mother and brother, Patrick, left Ireland and arrived in the United States in 1843. You can read about John's mother and brother here. John's bride to be, Miss Julia Byrne, was about 14 years old in 1843 so we do not believe John was married when his mother & brother left Ireland. However, by 1853 John and Julia were married and were welcoming the birth of their daughter Mary J. Losty. In 1853, John and Julia Losty were living in a area of county Kildare known as 'Green' which was in the Parish of Naas. 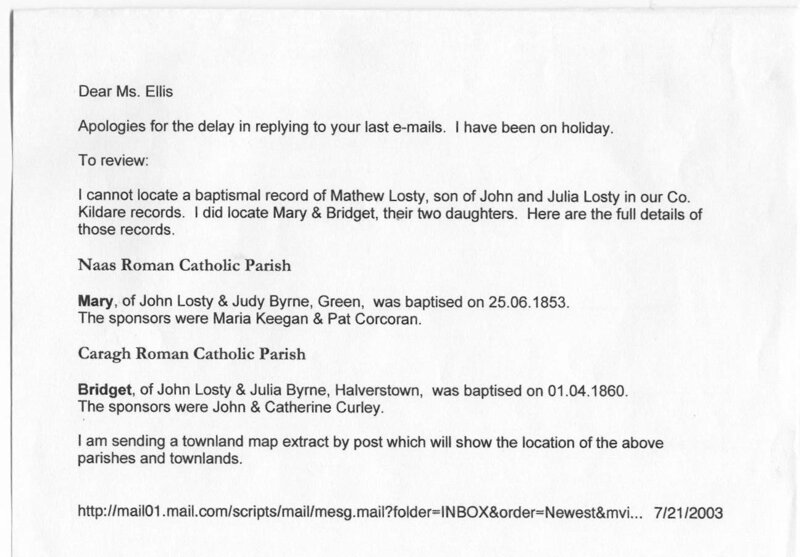 In June of that year John and Julia welcomed the birth of their daughter Mary J. Losty and baptized her on June 26, 1853 - sponsored by Maria Keegan and Pat Corcoran as noted in the record of her Baptism at the Naas Roman Catholic Church. Enlarge Document. Matthew was quite successful and produced 7 of John and Julia's grandchildren as you will later learn in our story. In 1859, Julia blessed John with another son, PAT LOSTY and no sooner than giving birth to Pat, Julia was again with child, giving birth the following year to their daughter BRIDGET LOSTY born March 31, 1860. The only references we have regarding Pat's existence is detailed further down on this page. According to Bridget's baptismal record, her mother, Julia, was living in Halverstown, which is located within the county of Kildare and the Parish of the Caragh Roman Catholic Church. Her Grandmother Mary Jane Losty was a native of Halverstown within the Parish of Caragh as noted on the Losty headstone in St. Josephs Cemetery, in Pittsfield, MA. Bridget's baptismal sponsors were John and Cathy Curley. Document Error: If you are wondering why Bridget's Baptismal record states her being Baptized in January of 1860, three months before she was actually born, you are not alone. We have no explanation for this error other than the possibility the record keeper -- upon entering Bridget's baptism date -- inadvertently wrote 1860 instead of 1861. It being only 4 days into the new year when her Baptism took place it is very likely the record keeper made this error. All other records of Bridget's date of birth indicate she was born March 31, 1860. It is unknown if John was still alive when Bridget was born. He passed away sometime after the conception of his daughter Bridget and April of 1863, when his wife Julia left Ireland with their children. It is noted on the Passenger Manifest Julia was widowed. No Choice but to move on . . . . .
Now widowed with 4 children to raise it was up to Julia to provide for her children. The promise of a better life in America circulating throughout Ireland during that time must have convinced Julia to risk the journey with the hope of improving life for herself and her children. 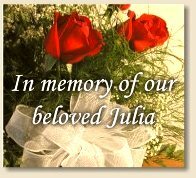 Julia left her home of 34 years in County Kildare, Ireland with her 4 children and headed to Liverpool, England. During that time thousands of immigrants were fleeing to America. Our research tells us, it was quite typical for immigrants to put up deposits for tickets abroad and then find work to earn the rest of the money needed for the trip; and it appears that is just what Julia did in June of 1862. Julia Losty, widowed age 34 destination Massachusetts USA. Traveling with her 4 children: Mary Losty age 8, Matthew Losty age 6, Pat Losty age 3 and Bridget Losty age 1. When tickets are placed on deposit or otherwise bought outright, their names are added to the Passenger Manifest. When Julia placed her deposit down for their ages were recorded on the Passenger Manifest as given above. However, by the time they boarded the ship "Cultivator" Julia's daughters, Bridget and Mary, had turned 2 and 9. As mentioned above, thousands of immigrants were fleeing their countries. Having to wait in line for everything including food was the typical scenario for many immigrants. Julia and her children remained in Liverpool for ten months before departing for America. In the spring of 1863 on or about April 1st, Julia and her children boarded the rigged ship "Cultivator" which was bound for The Port of New York. The family destination was Massachusetts, USA. The Bittersweet Journey . . . . It must have been quite difficult for Julia to bury her husband, console her 4 young children and then leave the only place she knew to be home with only her hopes and dreams of a better life. There were no assurances of a better life, or even that they'd make it to America. Many ships encountered disastrous fates crossing the great Atlantic. Some caught fire, others were stricken with disease and food was always in short supply in every case. Many passengers died. In fact, during The Great Irish Famine of 1846 to 1852 as many as two million Irish fled their homeland and another million are believed to have died trying. On the other hand, there must have been a lot of chatter aboard the ship of new beginnings in America and tales told of relatives who had already succeeded. So it was for the most part a bittersweet journey. Document Error: When Matthew applied for his U.S. Naturalization he was asked when he arrived in the United States. He gave the date of June 1862. He is also asked his age when he arrived given as age 7. He got the age right but his date of arrival was incorrect. We theorize the family left Ireland in June of 1862 for Liverpool, England and from there traveled to New York arriving in May of 1863. Cultivator Passenger List. The "Cultivator" encountered vast quantities of field ice and a great number of large ice bergs, but made no stops between Liverpool and England. There were 6 deaths and 1 birth during their voyage. 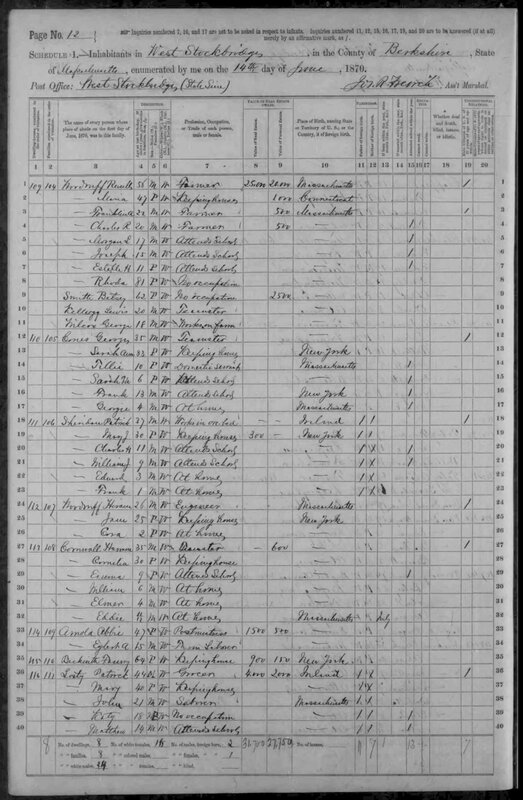 However, the "Cultivator" Passenger Manifest states their arrival date as May 9th, the day after the New York Times reported its arrival on May 8, 1863. This indicates to the reader the Cultivator arrived during the night and the passengers did not disembark from the ship until the next morning on May 9th, 1863 when the Captain signed and dated the Passenger Manifest. Three years earlier, in 1860, John's brother Patrick Losty was living in West Stockbridge, Massachusetts, and it was Massachusetts that was listed on the Manifest to be Julia Losty and her children's destination. It is not known to be certain, but it was most likely, Patrick Losty who greeted Julia and her children in New York in 1863 and took them to West Stockbridge, Massachusetts where they remained until 1866. It was during this time that John & Julia's youngest daughter, Bridget Losty became accquainted with her Uncle Patrick Losty and revered him as a father figure. West Stockbridge, Massachusetts 1860 U.S. Census. 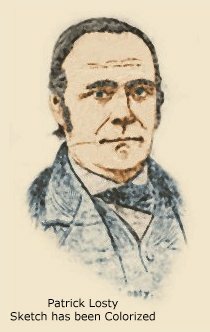 The photo above is a colorized version of Patrick Losty's image sketched in the Chatham County Newspaper upon his death. The original image and article can be viewed here. According to Bridget Losty's U.S. Naturalization papers she had resided in Hampden County, Massachusetts since 1866 and we believe it was that year her mother Julia left West Stockbridge and moved to Russell, Massachusetts. However, John & Julia's son Pat Losty remained in West Stockbridge with his Uncle Patrick. In 1870, Pat (listed as Patty) was 13 years old and working as a domestic servant in the home of Mr. Flich, a 54 year old man who worked as a Rail Road Conductor. 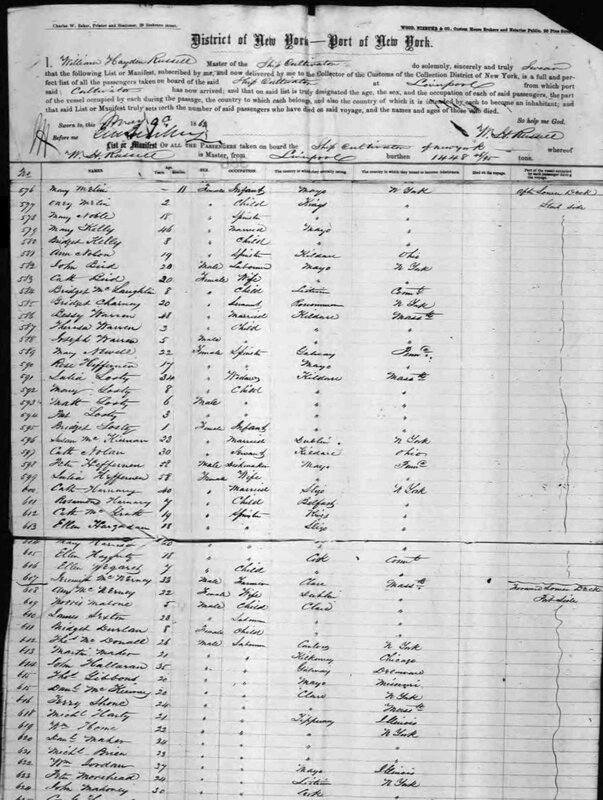 1870 West Stockbridge, Massachusetts US Census line 24. 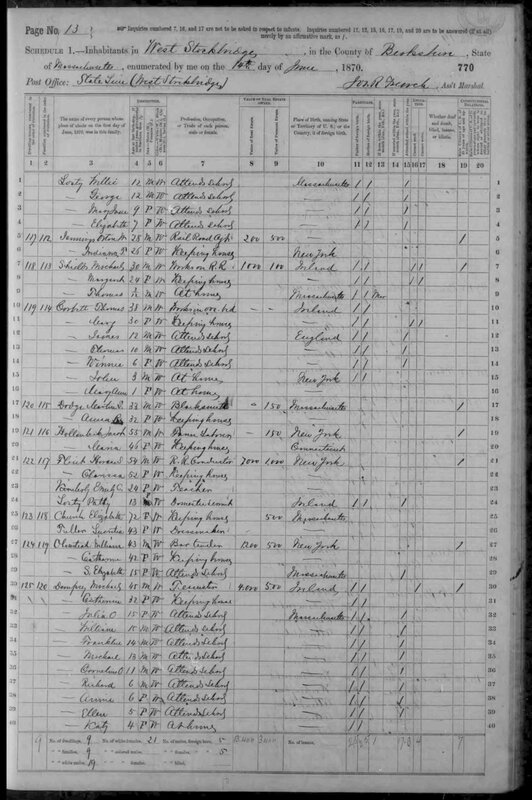 On the same census page appears 4 of Patrick Losty's children Line 1, 2, 3, 4. and on the previous page of the US Census are the rest of Patrick's children, including himself and his wife. Reference 1870 West Stockbridge, Massachusetts US Census line 36, 37, 38, 39, 40. Patrick Losty was employed with the railroad and living only a few houses down from where little Pat Losty was living and working. It is our belief that Julia left her youngest son Pat Losty under the watchful eye of his Uncle Patrick while she took her other three children with her to Russell, Massachusetts to seek employment. 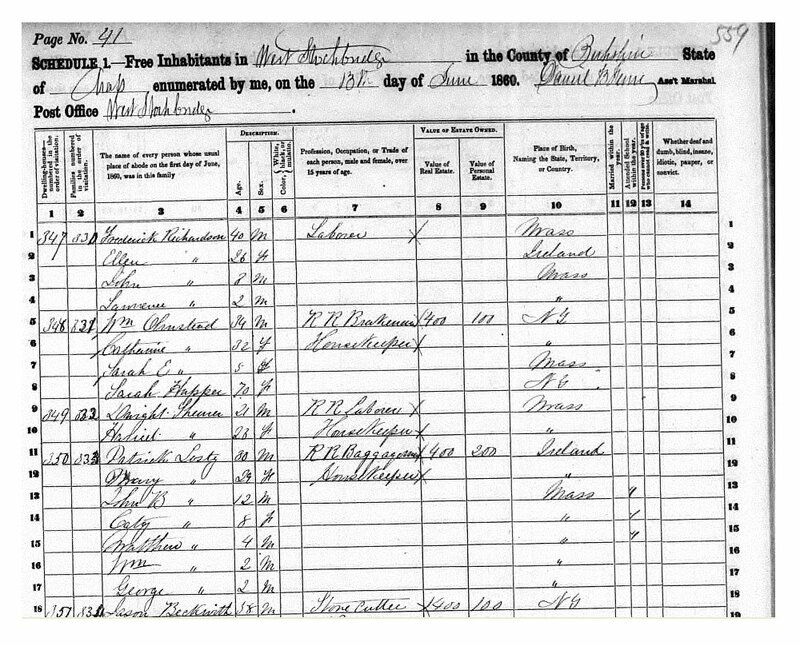 Note: On the census of 1870 Line 24 for Patty Losty you will notice the enumerator scratched off the original entry made regarding Pat Losty's gender. The enumerator originally wrote male, then later scratched that off and entered Female. It is possible the enumerator made this error based upon Pat's name being given as Patty, which to most refers to a female, but to the Irish, Patty is spelled Paddy and refers to a male person. In 1870 Julia Losty and two of her four children Mary and Matthew appeared in the Russell, Massachusetts - Hampden County 1870 U.S. census Line 19, 20 & 21. Julia age 40 and Mary age 17 were working in a paper mill. Julia's son Matthew now age 15 was a farm laborer. 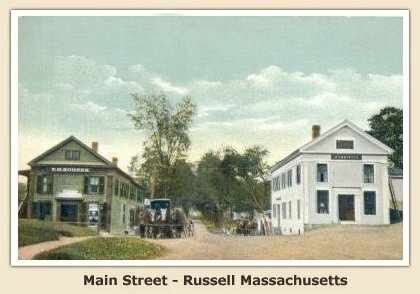 During our research we learned in Russell, Massachusetts, there were two employment opportunities available in 1870; working in the paper mills or working on the farms. Almost every person listed in the Russell, Massachusetts 1870 US Census, was working in one of those two positions. Children were often found working as domestic servants during the summer months to help support their families. (at least this was the case with Julia's children). In addition to Julia's son Pat working as a domestic servant, her daughter, Bridget Losty, was also working as domestic servant during that year in the home of Daniel McBride in Russell, Massachusetts. She was nine years old Page 12 Line 37. Note: 1870 Census Error: Page 12 line 37 1870 census for Russell Massachusetts in Hampden County list Bridget Losty as being born in Holyoke and that is incorrect. Bridget was born in 1861 in Kildare, Ireland and arrived in New York USA on May 9, 1863. 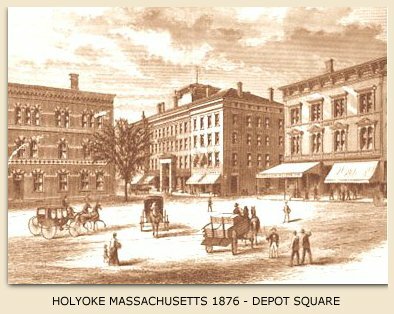 Sometime after the 1870 U.S. Census was taken and before or during 1873 Julia Losty moved to Holyoke, Massachusetts and is listed in the 1873, 1875, & 1876 Holyoke City Directory. It is unknown how many of her children were actually with her in Holyoke. The city directories only list the Head of Household. In 1877, Julia's son Matthew was 20 years old and on May 2nd, of that year, he married Miss. Catherine T. Burns of Holyoke, Massachusetts. Between 1876 and 1879 there are no City Directories or US census taken that would tell us if Julia (Byrne) Losty, remained in Holyoke, but it is our best guess that she did until April of 1880. On the 5th day of April 1880, Julia's oldest daughter, Mary J. Losty, passed away at the age of 27 and her death record indicates she was laid to rest in Pittsfield Massachusetts. The same town where her Grandmother Mary Jane Losty was laid to rest. We have yet to prove the following theory however, we have strong suspicions Julia Losty and her son Pat Losty returned to Ireland after the death of Mary. 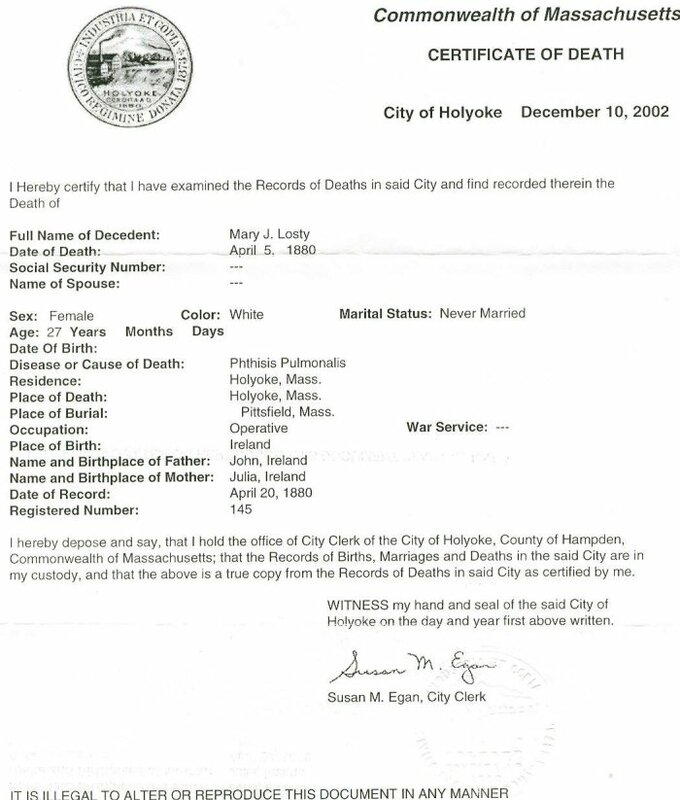 We cannot locate a death record for Julia (Byrne) Losty or her son Pat Losty, nor do they appear in any of the U.S. Census's from 1880 onward. Based upon the absence of these records, we believe upon the death of Mary J. Losty, Julia was devastated and overwhelmed with grief. Her hope for a better life in America was not living up to its reputation for Julia. Things were going terribly wrong. She had lost her husband in Ireland, sailed across the Atlantic for with her 4 young children, struggled to survive the seventeen years she was in the United States (so much so her babies were having to work at the ages of 9 and 13) and then her eldest daughter dies at age 27. This must have been more than Julia could bare. The straw that broke the camels back so to speak. We believe Julia took her daughter Mary to Pittsfield to be buried upon the instructions of Patrick Losty, the only male adult figure in their lives, and picked up her son Pat Losty who had been under the watchful eye of Patrick in West Stockbridge (only 15 miles from Pittsfield) and set sailed for Ireland. Note: In June of 1880 , two months after Julia buried Mary, the US Census in Holyoke, Massachusetts was taken. Neither Julia or Pat were listed. This confirms our believe that Julia left for Ireland just after Mary died in April of 1880. Although life in the United States did not result in great success for Julia, her efforts were not in vain. As a result of Julia's decision to come to America, she laid the foundation for her children and grandchildren and their children's children to live and prosper in the Great Nation we live in today. Julia's son Matthew who remained in the United States was very successful and all of the families who are descended from him owe a huge debt of gratitude to Julia for sacrificing so much for the rest of us.